Something scary happened on Sunday. It was really scary. That morning was just like any other; I was preparing to walk the Milt, and Jeff's parents, Momeaux and Pop, were in town again to help on our fence. This was the big push to finish the front gate where our cars drive in and out. That was the the one that we really wanted fixed because right now we just have a chain link fence that does not close well, so it is not terribly safe for Milton. Before we left on the walk, all four of us were standing at that gate holding up the wooden skeleton of the new gate to take further measurements. Milt was doing his thing, sniffing around, and Jeff asked me at least twice to go put him in the house. Of course, I did not pay Jeff any heed because I love Milton to be occupied and in the thick of things. It makes everything more fun. Well, Milt decided to hop right on through that open gate, and he made a break for it, straight down the driveway. I ran after him, and I called his name which turned the dash into a game. Milt was running fast with both of his back legs kicked up. All of a sudden, I saw a bright red car zooming in on the left, and I saw my beautiful boy to the right in the middle of the street. Then Milton ran straight into the car with one hard hit. I was totally and completely terrified. Milt ran immediately back to me with his entire left side limping and whimpering loudly. That red car just briefly slowed and then continued on. Milton was in shock and scared; the more I cried, the more frightened he became. We got him back up to the house, and we checked him out. Despite the limp, he did not flinch or cry out when we touched any other part of his body. We also checked his cognitive abilities, and he responded when his name was called, and he easily caught treats in his mouth. The Milt had one cut on his snout where the fur had been torn away that was bleeding a little, but there was no blood gushing from his mouth, thank goodness. To put it lightly, I felt incredibly awful. It was a mixture of feelings - guilt that I was so lax in not putting him in the house, horror that with a split second change Milt would have been dead, anger that I could have either gimped up Milt's ability to walk or damaged his brain for life with my stupidity. The list goes on and on. I spent much of Sunday either openly crying or silently tearing up. Ever since my dad passed away, I have a heightened sense of mortality, and I really hate to ever let Jeff or Milt out of my sight. Jeff and his parents were fantastic. They kept a much more level-head than I did. Jeff, especially, was very sweet to me even though I did not listen to him earlier. Milt rested the entire day; that hit took a lot out of him. All of us kept a watchful eye over him, and by late afternoon, he was acting more like his old self. The limp began to recede, and we knew he was feeling good when he ran for the freezer when he heard ice cubes rattling. Likewise, he had to come and get in Momma's face when he heard her cooing over Uncle Dusty, Momeaux's bichon frise. We called the vet hot line Monday morning, and they basically said that if he was acting normally without vomiting, diarrhea, or lack of appetite, then he should be just fine. Needless to say, I am eternally grateful that the Milt survived. His death would have wrecked us. I honestly don't know what we would do without our boy. Jeff and I know that God was teaching us a very powerful lesson. He wanted us to realize that we cannot be so cavalier with our care of Milt. A few things are now going to change around here. 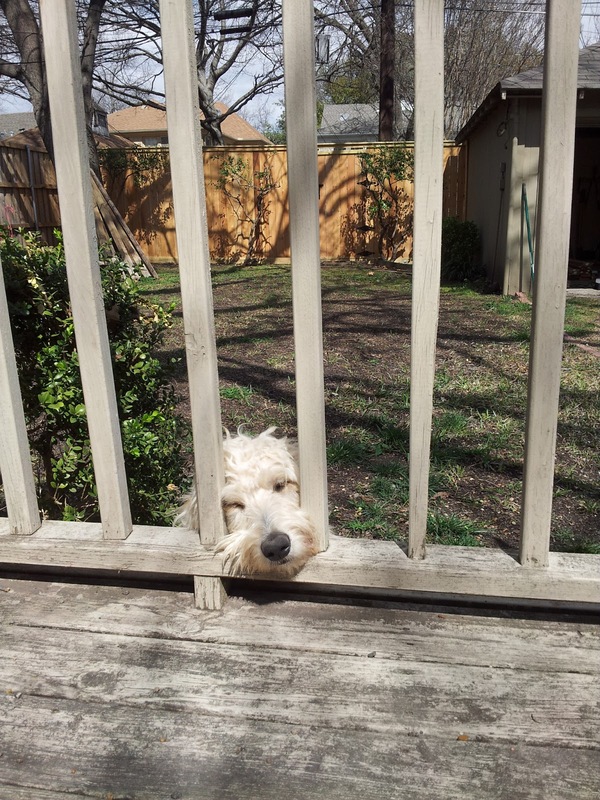 Milton will always be sequestered in the backyard with no hopes of escape. No more neighbors walking the Milt home because we are too lazy in minding the gate. When I take him in and out of the car, I am always going to snap his leash on instead of letting him walk freely to the front door; it is just too dangerous. About a month ago, Milt's tags broke off, and we never bothered to put them back on his collar. Now they are all on in case we ever do lose him while out walking, on a road trip, etc. Last, Milt is a backseat doggie, with his seat belt securely fastened, from here on out. We bought that seat belt for our trip up to New York, and then we buried it away in the trunk. I admit I have been incredibly irresponsible with letting him ride up front and even stick his head out the window with this traffic. No more. It is safety first because bad things happen in this world. The Milt's our Wonder Dog, and someday, 10 years from now, I know we will look back on this and recall the time that Milt hit the car and not the other way around. For now, we are just going to squeeze that boy tight and kiss him hard every single opportunity we get. Heidi... that is so scary and I'm so glad that Milton is okay! 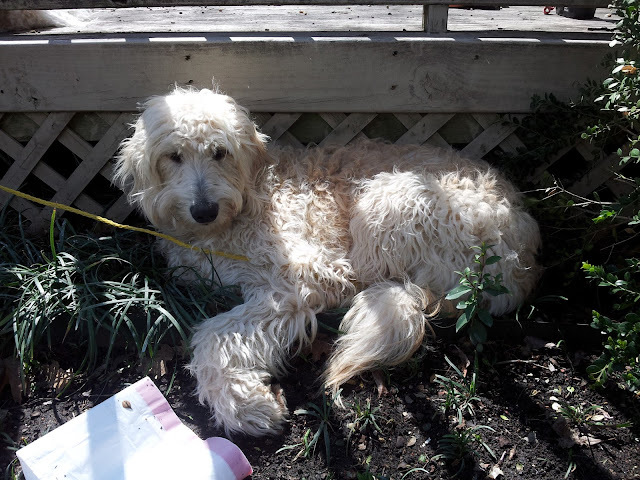 You're right things do happen and we have to make sure we love our doodles each and every day they are here with us :) Give Milton a hug from us and I hope he is 100% better by now. Oh your poor thing, sounds like you suffered more than Milton did. I agree, lesson learned, new rules, and guilt goes to the back of the closet. Hugs to you both and kudos to Jeff for not making you feel worse. And as for the driver of the red car? Next time you see them in the neighborhood, make yourself known. I can't believe they didn't stop! People are crazy sometimes... unbelievable. Goob, St. Patty's Day is on the horizon! What are your plans? AMEN to that! What is wrong with people! I would have jump out of my car to make sure the Milt was okay!!!! What Happens to a Toy Chewed Up?